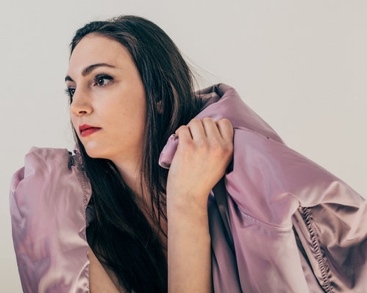 Instead of performing on a stage away from the audience, the new dance show, OUT OF BOUNDS, curated by dancer-choreographer Meagan Woods of Jersey City, will have dancers moving on stage and in the audience. Hudson County Community College welcomes community partner New Jersey Performing Arts Center (NJPAC) for a year-long partnership of FREE programs. Join the Department of Cultural Affairs for the NJPAC Teen Jazz Performance on Tuesday, October 24 from 5:30-7:30 pm. Light refreshments will be served. 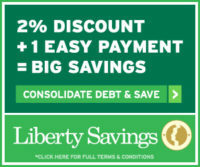 Sign up today! This event is part of our “Twilight Tuesdays” series which includes artist receptions, faculty mixers, author readings, workshops and more. Mackenzie Menter as Juliet and Joshua Blount as Romeo in HSC’s Romeo & Juliet. What happens when two feuding families poison the love of their offspring with their hatred? Do the sins of the fathers cast evil on their children? Can love ever survive when surrounded by hate? 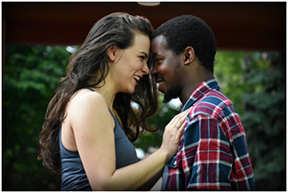 Live Local Theater in Jersey CityMackenzie Menter as Juliet and Joshua Blount as Romeo in HSC’s Romeo & Juliet.Romeo and JulietteRomeo and Juliette presented by Hudson ShakespeareSally DeeringShakespeare playsStory about lost loveWhat was Shakespeare most famous play? Mile Square Theatre presents the Peanuts Gang in their Hit Musical! In 1967, You’re a Good Man, Charlie Brown opened Off Broadway at Theater 80 in the East Village, and 50 years later it still charms and delights audiences of all ages. Songs like “Suppertime” and “Happiness” are classics of musical theater and cartoonist Charles M. Schultz’s characters Snoopy, Lucy and Charlie Brown are as iconic – and adorable – today as they were back then. 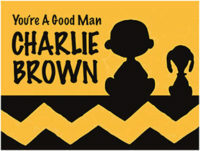 Mile Square Theatre in Hoboken opens its 2017 season with You’re a Good Man, Charlie Brown beginning Friday, Feb. 3 and running through Sunday, Feb. 26. The musical, featuring Schultz’s Peanuts Gang is a series of vignettes about Lucy who worships Schroeder who worships Beethoven; curious Sally and Linus, who doesn’t feel complete without his blanket; and Charlie Brown and his funny, loyal and precocious pup, Snoopy. 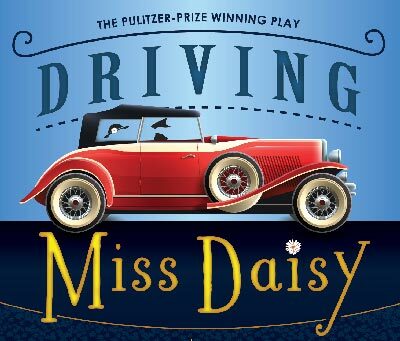 Mary Kate Burke directs with musical direction by Terri Gorgone, and choreography by Sarah Weber-Gallo. Jen Price-Fick designed the set. 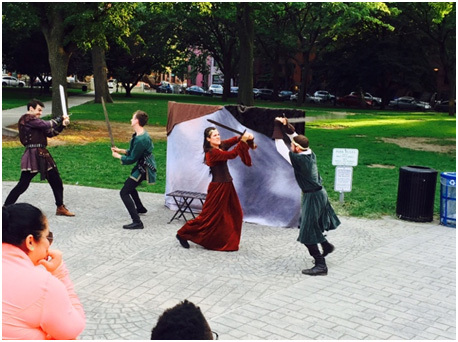 Swordplay abounds in EDWARD III put on by Hudson Shakespeare Co.at Hamilton Park in Jersey City. Rachel Matusewicz as Countess of Salisbury clashes swords with Isaac Andrew as King David of Scotland; while Lord Audley (l.), played by Conrad Aurelius battles with Douglas, a Scottish Nobleman played by Keith Hale. Never mind getting upstaged by fancy swordplay or an actor taking too long for his death scene. 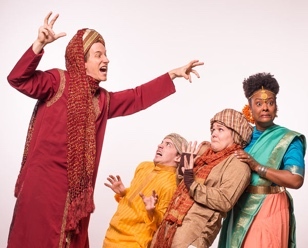 Hudson Shakespeare Company’s adaptable actors must endure teens on skateboards, barking dogs, ambulance sirens, even low-flying helicopters while they project the dense and rhyming lines of The Bard. 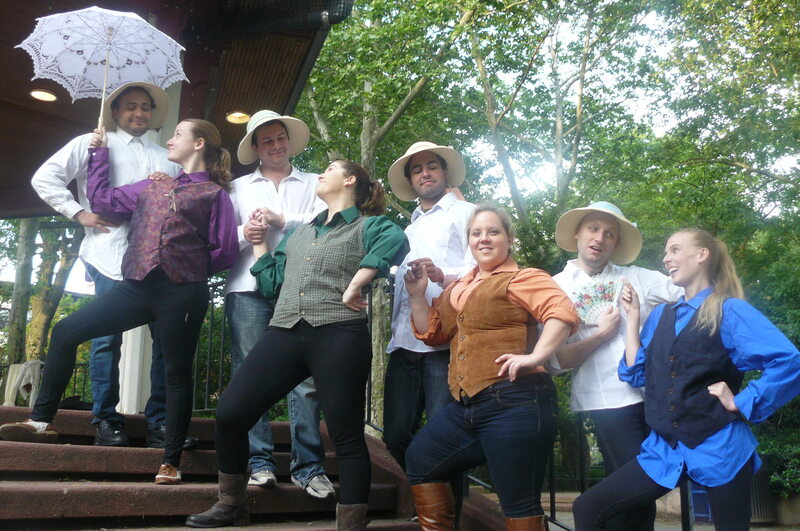 Such is the actor’s life when performing with the Hudson Shakespeare Company, now in its 25th year. This summer, the ensemble puts on three Shakespeare plays and will bring Henry IV, Parts 1 and 2 to Hamilton Park on Thurs, Aug. 18 at 7 pm. Admission is free thanks to support from the Hudson County Office of Cultural Affairs and other supporters of the arts. On a recent Thursday evening, local park-goers gathered in Hamilton Park for Edward III. On Friday,November 19, Mile Square Theatre staff and trustees shared a momentous occasion for the arts in Hudson County with an excited group of stakeholders. Leading the way with a ceremonial groundbreaking was MST Trustee President Zabrina Stoffel, MST Education Director Chase Leyner, Hoboken Mayor Dawn Zimmer, and Hudson County Freeholder Anthony Romano. 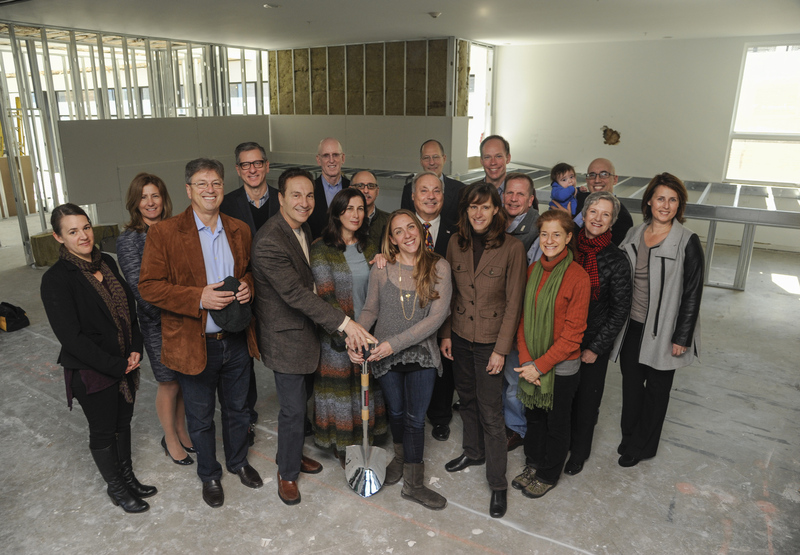 Mile Square Theatre’s new facility is designed by Nastasi Architects and is being built by Sabia Construction. It’s scheduled to open in March, 2016. MST Education programs will operate from the new facility, and the company will soon announce its first season of plays at the Artisan. Cast photo featuring top down Carlos Muniz, Makenzie Daris, Andrew Benvenuti, Olivia Dreyer, Chris Morriss, Noelle Fair, J.P. Makowski and Samantha Morrice. That’s the tagline for the new play THE HOUSE OF ATREUS which premieres Thursday, June 4, at Art House Productions in Jersey City. 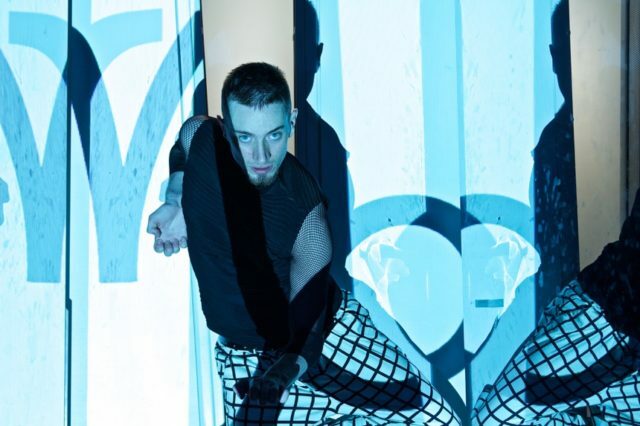 It’s a collaborative work between Christine Goodman (Executive Director of Art House Productions) who wrote the piece, Mason Beggs, who directed, and choreographer Meagan Woods. 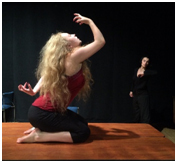 THE HOUSE OF ATREUS is an immersive and unconventional theater piece. 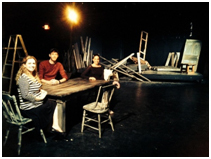 Instead of putting the actors on stage and the audience in rows of seats to observe, the set takes up the entire theater with a chair and TV in one area, a broken down porch in another, and a dining room table at center. The audience enters through a haze of smoky fog and is encouraged to find a spot of their choosing to watch the play as it unfolds around them. 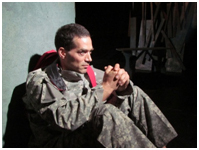 This immerses the audience into the play’s action, which becomes part of the overall theater experience.